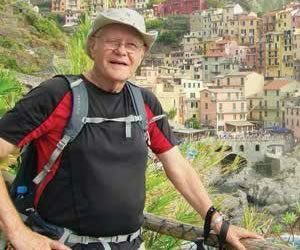 Even at 79, Orangeville resident Harry Anderson keeps right on trekking. In 2007 Harry set out to follow in the footsteps of the pilgrims who have been treading the 800-kilometre Camino de Santiago – the Way of Saint James – since the Middle Ages. Starting in France, he spent 35 days backpacking up into the Pyrenees and across northern Spain to Santiago de Compostela. Two years later he did it again, this time with his daughter Karen. Harry Anderson during a trek in Cinque Terre National Park above the town of Romaggiore, Italy. Next, Harry completed the 200-kilometre hike from Le-Puy-en-Velay to Conques, France, and in October 2016 he returned to Europe and walked 160 kilometres of the Portuguese leg of the camino, from Ponte de Lima to Santiago. In between his camino hikes, Harry trekked the Douro Valley in Portugal, Cinque Terre National Park in Italy, and sections of our own Bruce Trail. To keep in shape for his treks, Harry takes twice-weekly tai chi lessons with the Headwaters School of Tai Chi and leads the local Probus Club’s walking and hiking group. A teacher and librarian during his working career, Harry and his wife Marg recently celebrated their 50th wedding anniversary. In 2002 Harry was awarded the Queen’s Golden Jubilee Medal for his work in scouting. He became involved in the movement during his son’s scouting years and stayed on as a scout leader, becoming the commissioner for Dufferin County and later a regional commissioner. As for the future, Harry and his son Douglas, an Episcopalian rector in Texas, plan to walk part of the Camino de Santiago together when Harry turns 80. But this May, he will hike a section of the Camiño Ignaciano through northern Spain’s Basque country. And always beckoning is a remote and relatively unspoiled 100-kilometre trail in Hong Kong’s New Territories. Harry considers himself in the middle of his golden years. With a twinkle, he maintains that his trekking adventures will be something to look back on when he gets old. “You are only here on Earth for a short time. Use it well.” he says.